Sally Casswell, Chair of the Global Alcohol Policy Conference (GAPA), Simon Harris TD, Irish Minister of Health and Catherine Byrne TD, Minister of State for Health Promotion and the National Drugs Strategy, has announced that GAPC 2020 will be held in Dublin, Ireland. 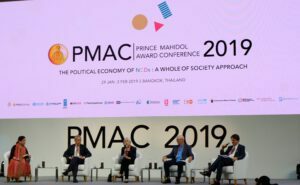 31 January – 3 February, several GAPA representatives participated in the recent Prince Mahidol Award Conference (PMAC) in Bangkok. See here for more information. 29-30 January, GAPA co-hosted two side meetings in the days prior to the PMAC conference. More information. 2 October – GAPA Chair Professor Sally Casswell debated with Scott Ratzan of the AB InBev Foundation about the opportunities and challenges of private-sector collaborations with academic public health in an event organised by the Boston University School of Public Health. 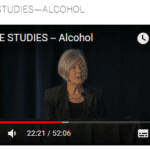 See the Alcohol case study debate. See more information about the event. 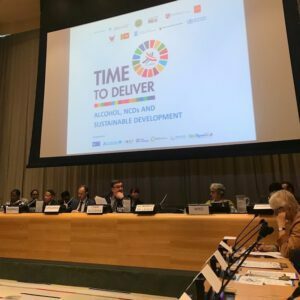 28 September, GAPA involved in the side event “Alcohol, NCDs and Sustainable Development – Where do we stand and where do we go?” held in the United Nations Headquarters in New York in connection with the UN High Level Meeting on Non-Communicable Diseases. At the side event a new WHO-led global initiative was launched – SAFER – aiming to reduce the harmful use of alcohol. The side event was organised by World Health Organization, Slovenia, Sri Lanka, Estonia, Thailand, Suriname, Sweden, Philippines and IOGT International. 24 May, GAPA chair Sally Casswell speaks at a side event during the 71st World Health Assembly: “FROM BURDEN TO SOLUTION; Ending TB, beating NCDs and achieving Health for All through Alcohol Policy Best Buys Implementation” hosted by Permanent Missions of Botswana, Estonia, Guyana, Slovenia and Thailand together with IOGT International. 13 March, UNITAR must end alcohol and road safety partnership with ABInBev. In a joint open letter GAPA has reiterated the concerns over United Nations Institute for Training and Research (UNITAR) having entered into partnership with the world’s biggest brewing company, Anheuser-Busch InBev. Partnering with the alcohol industry to promote road safety constitutes a fundamental and grave conflict of interest, says the letter. Read the letter here. 2 March 2018. “The constructive meeting is first step towards ending Global Fund’s ill-advised partnership with Heineken, though concerns remain,” the three organisations stated after having met with Global Fund Executives in Geneva. Read the statement here. 1 February 2018, sending a joint letter of concern to The Global Fund together with IOGT International and NCD Alliance regarding the announced partnership between The Global Fund and Heineken. The letter is being endorsed by a number of civil society organisations and networks. 4-6 October 2017, Global Alcohol Policy Conference 2017 was held in Australia with the title: “Mobilising for Change: Alcohol Policy and the Evidence for Action”. 26-28 June 2017, GAPA attended the WHO Forum on alcohol, drugs and addictive behaviour at the WHO Head quarter in Geneva. May 2017, GAPA attended the 70th World Health Assembly in Geneva. 26 August 2016, Seminar “Curbing industry marketing of harmful products to young people”, Protea Hotel Sea Point, Cape Town, with Health Promotion and Development Foundation Network, South Africa. 7–9 October 2015, Global Alcohol Policy Conference 2015, Edinburgh International Conference Centre, Edinburgh, Scotland, United Kingdom. This event was cosponsored by the World Health Organization, which published this information after the meetings. 16 May 2014, Meeting in Brazil: Seminário Internacional; Álcool & Violência a Influência da industria do álcool, Sao Paulo, Brazil. February 2013, Statement of Concern: The international public health community responds to the global alcohol producers’ attempts to implement the WHO Global Strategy on the Harmful Use of Alcohol. Download the full report here. 13–15 February 2012, Global Alcohol Policy Conference 2012, “From Global Strategies to Local Actions”, Impact Convention Centre, Nonthaburi, Thailand. 20 February 2011, Cambridge, England. Alcohol Policy Youth Network. First meeting “European-wide Consultation on Promotion, Marketing, Price and Availability. 24–25 April 2006, Geneva, Switzerland – Participated in a meeting between WHO secretariat and representatives from 20 nongovernmental organizations and professional associations in Geneva. 20–21 March 2004, Delhi, India – Consultation on the formation of an Indian Alcohol Policy Alliance. 24 September 2003, Cambridge, England – GAPA meeting with Eurocare and WHO. 24–25 November, Bangkok, Thailand – South East Asia Consultation. 31 July – 6 August 2001, Syracuse, New York State, USA – Inaugural conference.